The Tytherleigh Horse, Pony & Gymkhana Show was set up after the first world war to raise funds for the wounded. It no longer raises money for the original cause but supports a nominated charity each year. In 2012 the chosen charity was S.U.R.E. and a cheque for £1000 was presented to the treasurer of S.U.R.E. Wednesday 12th June 2013 at the home of Paul Dunning (Show Committee Member) Mistletoe Farm, Eleighwater, near Chard. The show was held on Sunday 12th August at Windwhistle on the A30 between Chard and Crewkerne and is one of the few remaining like shows. 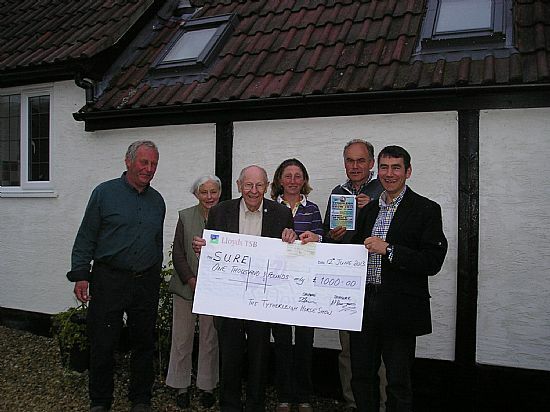 The photo shows David Carslake (Show Chairman) presenting the cheque to the S.U.R.E. 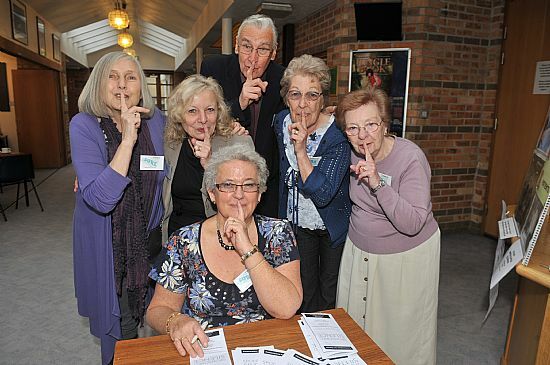 Treasurer, Roy Hole (3rd from left) in the presence of other show committee members. S.U.R.E. is very grateful for this valuable unexpected donation. Wellington School Masonic Lodge support S.U.R.E. The cheque gladly received by SURE treasurer Roy Hole for £200 from the Wellington School Masonic Lodge will be added to the funds for the new Synergy Imaging System, the approximate cost of which is £450,000.00. 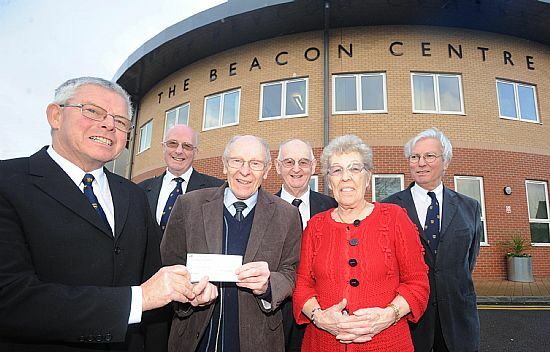 From left Mike Eastick, Alan Baker, Roy Hole (SURE Treasurer), Ken Trump,Vicky Gordon (SURE Fundraiser) and Ken Jones. Mike Eastick, immediate past Master of the lodge selected our charity to benefit from donations collected at meetings in memory of a close family member who lost his battle with cancer. Vicky Gordon said "We are extremely grateful to Mike and the Freemasons for their generosity". Kim Miller - hair raising for S.U.R.E. Kim Miller of The Salon, Eastover, Bridgwater raised £189.25 for S.U.R.E. by dying her hair various colours. 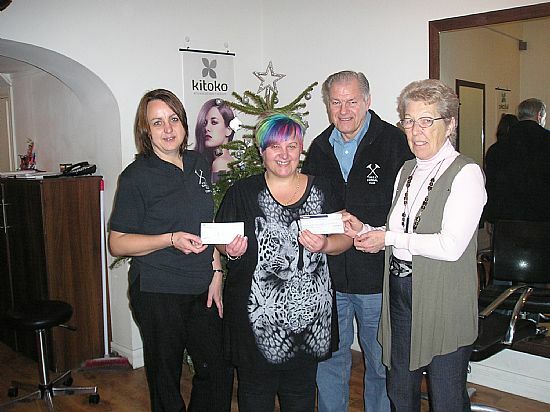 The cheque was presented to Vicky Gordon at The Salon on Thursday 20th December 2012 by Kim and members of the Bridwater YMCA Carnival Club who supported the donation. The photograph shows Kim handing over the cheque. 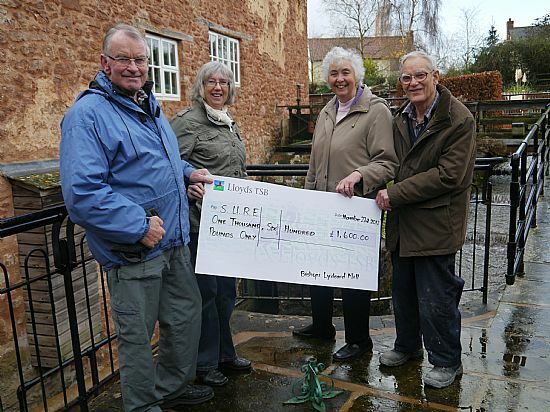 "Bishops Lydeard and Rural Life Museum Cheque Presentation. much appreciated by, not only Charlie and Yvonne, but S.U.R.E. themselves. special thank you to you both." Pat and Paddy Potter held a dinner and dance with 190 guests at Somerset County Cricket Club on October 6th 2012. This raised the fantastic sum of £6,505 for S.U.R.E. Paddy was diagnosed with prostate cancer and received treatment at the Beacon Centre through March and April this year. In appreciation of the wonderful care by everyone at the centre Paddy decided he would like to give something back. A good time was had by all. Paddy and Pat would like to thank everyone for their help, generosity and support. Especially the guidance and assistance from Sarah and nigel Hill who had six years previously raised a large donation themselves from their own Ball in aid of S.U.R.E. 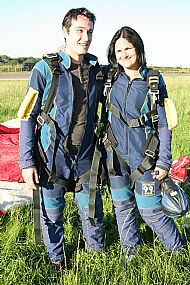 Jean and Wesley Jenkins, who has also received treatment at the Beacon Centre, they raised an amzing amount of donations for Paddy. Not least Tina and Beverley who worked so hard to get all the wonderful prizes donated for the raffle and sold the tickets. Thank you all from Pat, Paddy and S.U.R.E. Celebrating S.U.R.E. 's one million 5p coins at The Beacon Centre are senior radiographer Stuart McGrail, Roy Hole, Vicky Gordon, physicist Chris Hasler, Cynthia Law, Charlie Greedy, Jeff Gale, Joan Greedy and Barrie Palmer. On their own they are an absolute pain, hiding in trouser pockets, handbags and generally being a nuisance. BUT in S.U.R.E. 's hands they become a valuable aid in the fight against Cancer. How is this possible? Just look at what one million of these pesky coins helped S.U.R.E. purchase for The Beacon Cancer Centre in Taunton. These test pieces of equipment help keep the Radiotherapy department at the leading edge of the treatment of cancer. Your valuable support in collecting these 5p coins has, and will continue to help us in our assistance to The Beacon Centre. So please carry on collecting these pesky coins for S.U.R.E. Beacon Centre that this was the least we could do in a way of thanks to them. We raised £801 and still money to come. 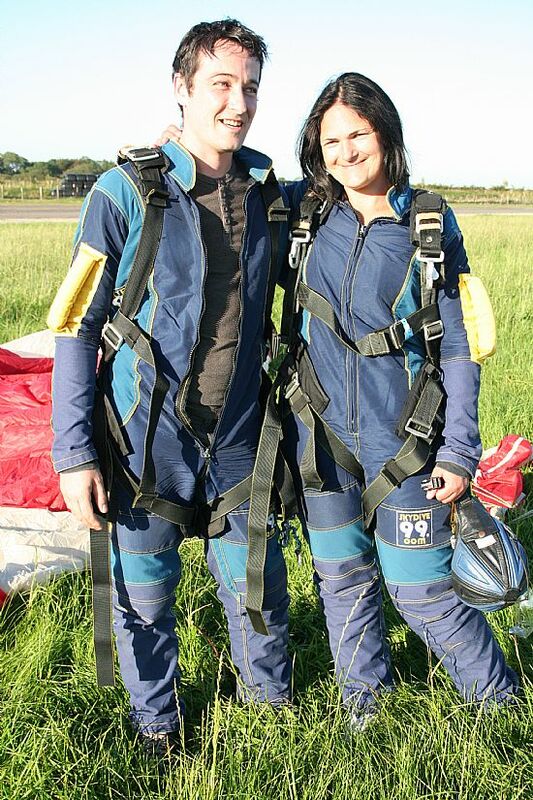 We both enjoyed the jump even though it was scarey! Thanks to every one that supported us. 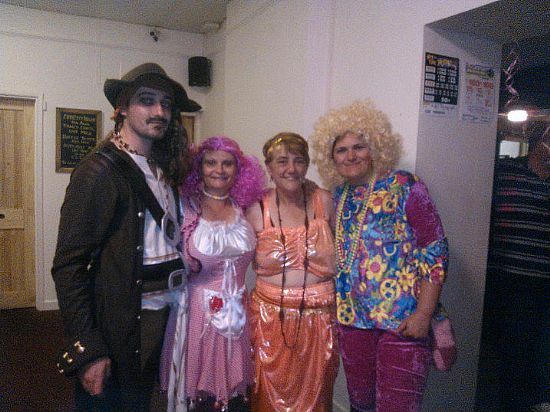 companies that donated prizes for the raffle and to Williton Social Club for hosting the event. 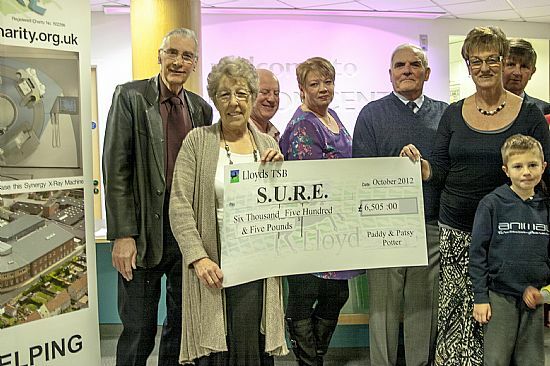 Our thanks go to Dennis and Rosemary Buckingham for their donation of £164, which they raised for S.U.R.E. by holding a whist drive at Oake Village Hall on 23rd September 2012. Dennis and Rosemary are well known for holding first class whist drives, and so it proved, the event was well attended, with twenty one tables, and as usual, the prizes were of a high standard. S.U.R.E. would like to take this opportunity to thanks the helpers, and everyone that enjoyed the afternoon's entertainment. Well done to you all. If you would like to run an event for S.U.R.E. we would be only too pleased to put it on our website. 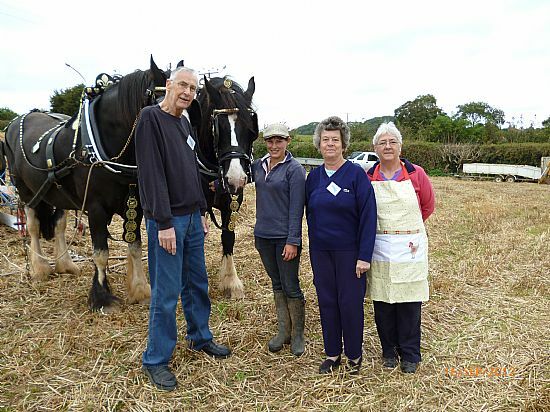 The annual Kingston Vintage Ploughing Day held on Sunday 16th September at Tarr Farm by kind permission of the House family and Mrs Sheldon. The dry weather brought the ploughs into action. Four pairs of Shire horse joined the fun, two local teams from Spaxton and two pairs from Cornwall. Seven various vintage tractors and a horticulture tractor with a single furrow plough also joined in. A good day was had by all, a light lunch and hot drinks were supplied by the Mancini family. Another date for 2013 has been set for Sunday 22nd September following the Bridgwater Ploughing Match. Thanks to all prize donors a raffle was drawn at the end of the day. Thanks to everyone involved for a great day. £212 was raised for S.U.R.E. Some of the over 100 people who took part in Contemplate for Cancer, at Queen's College Taunton, on 14th April 2012, raising £7044.70 for S.U.R.E. Members of the West Buckland W.I. 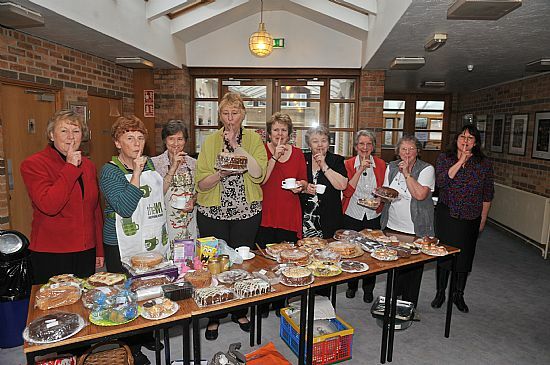 who ran a cake stall at the event. With the recent opening of the Mould Room and facilities at the Beacon Centre, at a cost of £300,000 to S.U.R.E., we have now reached another milestone in helping to keep the centre as one of the top in the world for cancer care. The Somerset County Gazette, a long time patron of ours, have always been most supportive of our projects, this can be seen with the amounts donated every week, which currently stands at over £300,000 since we had the pleasure of their support. This remarkable local charity would like to thank everybody for their donations and friendship over the years. As the past president of S.U.R.E. Eric Saffin said, "It is this closeness with the local community that S.U.R.E. 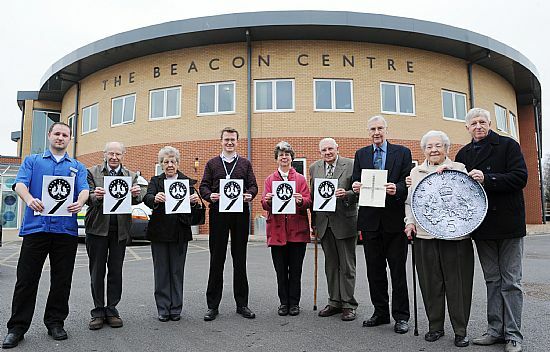 has been able to purchase essential equipment for the Beacon Centre". S.U.R.E. 's next projects are a Synergy Imaging System, this is very similar to a C.T. Scanner, except it is installed on to the Radiotherapy Machine, and this enables the Radiographer to take very clear 3D pictures of the treatment area, and make any adjustments as required. The total cost to S.U.R.E. will be approx £450,000. We are also commited to purchasing a 4D/CT imaging system, which takes into account both patient and tumour movement. Radiotherapy is then targeted to the patients breathing cycle, thus reducing damage to healthy tissue, the cost of this will be approx £85,000. S.U.R.E. are confident that with the help of the Gazette, and their loyal readers, these targets will be achieved.